Covering an area of about 52 hectares in its glory days, Bazangan or “Kol Bibi” Lake is located east of the very wealthy city of Mashhad and is the largest natural lake in north east of Iran. 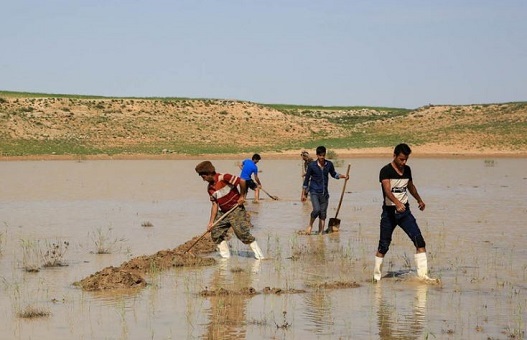 The local and federal authorities never even started a “save lake Bazangan” initiative, no governmental or international aid was made available and the Iranian Department of the Environment did absolutely nothing. The once almost dead Barzegan only came to life for one reason: when the unexpected rainstorms started, the villagers residing around the lake all came together, building water channels and leading the rain falling on dry ground to the streams feeding the lake. The residents of four villages, “Ab Deraz”, “Ghorghore”, “Bazangan” and “Kalateh” – those whose lives and livelihoods depended on the environment of the lake for centuries – came together for action. They built channels with shovels and mechanical tools to lead the very rare rainfall to the stream and springs that feed the lake. For the past 10 years, Lake Bazangan was facing the same fate as Lakes Urmia and Hamun: it was drying up. This is mostly because of drought, water evaporation, rivers drying and most importantly the pumping of groundwater from the area surrounding the lake to provide water to the uncontrolled residential and tourist site expansions. Years of drought after drought and Lake Bazangan is shrinking. Today it only covers 35 hectares of water surface area. Water levels in the lake have also fallen from a peak of 12 meters in its glory days to 2 meters. The local authorities have confirmed that in addition to the drought, the lack of proper infrastructures for flood and surface water management, the vacation house developments around the lake (without considering the environmental impacts) have contributed to Barzegan’s slow and painful decline. Ali Nasirian, the district chief of the local government of Marzdaran (the district the lake is located in), has pointed fingers to land privatization. 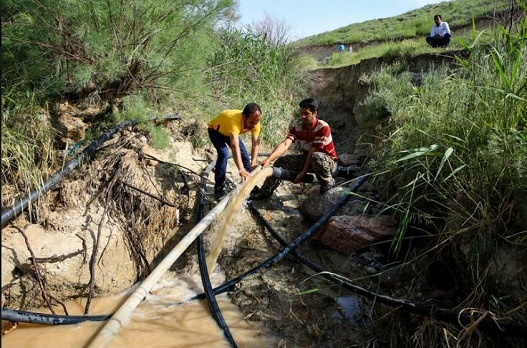 According to Nasirian allotment of lakefront land to private owners in the northern borders of Lake Barzegan has drastically reduced the flow of water from steams and springs that are in the northern formations surrounding the lake. A few years ago when lake Bazangan was officially announced as an “tourist area,” vacationers flooded the area. Shortly land prices around the lake went up and the processes of allocating land to private owners began. In whatever way, buying of the land around the lake trespassed into the borders of public and national lands. Before long, the land around the lake Barzangan shared the fate of many natural and national resources in Iran: land speculation. Mohammad Javad Alipur, the former head of the Department of Environment of City of Sarakhs (the first city near Lake Bazangan) announced in March 2015 that in the past years corrupt individuals affiliates with the Department of Environment and Natural Resources have abused power and were linked to the current state of public land speculation and environmental damages around the lake. In relation to the legal cases related to Lake Bazangan however, no names of government officials or institutions are exclusively noted with seizing of the lakefront lands. 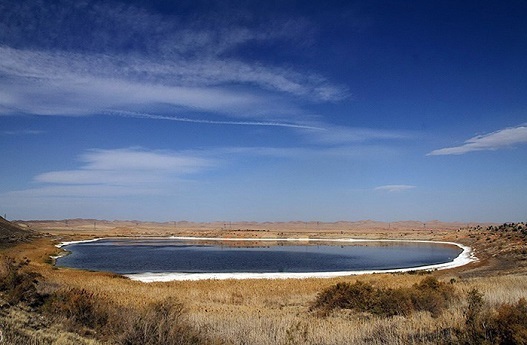 However, Iran’s Department of the Environmental over the years 2014 an 2015, was trying to pursue a “Comprehensive Plan and Management Project of the Natural Heritage Lake of Bazangan,” a plan that is yet to be established. Following the rainfalls of mid-May 2016, the local residents around the lake could no longer wait. Many pools of water were accumulating on the formations surrounding the lake. The villagers with the help of the village councils and the district chiefs started building channels to direct the flood water into the lake. At the same time campaigns started on the social media and the number of volunteers increased; people who cared for the environment drove to the area to help revive the lake. 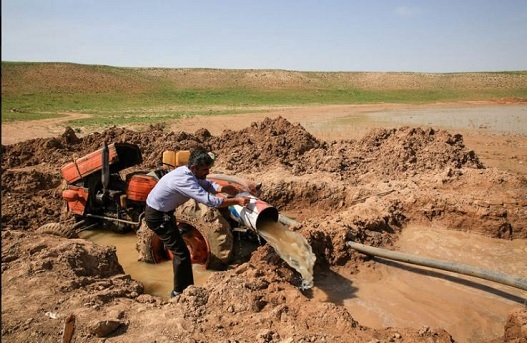 The local farmers brought all their mechanical tools, mechanical shovels, tractors, water pumps, etc… In seven days, the volunteers were able to direct more than seven thousand cubic meters of water into the lake. The locals also used water pumps to physically pump the water into the lake from an elaborate piping system they had set up that in some areas went as far away as 800 meters. The farmers so selflessly, helped the volunteers so that at different times of the day, the surplus agricultural water could be transported into the lake. The district chief of Marzdaran now says that one third of the lost water level has been restored and the water level has reached a 7 meter depth. Until last winter, shallow waters and the salinity concentration of Lake Bazangan threatened the aquatic life and the migratory birds that came to the lake. Now, there is more confidence that the Bazangan ecosystem might survive after all: a lake full of carp and trout with ducks and other migratory birds around. Bazangan Lake revival in May 2016 is a story that perhaps the local will tell for years. A story that might get quoted to the many tourists that come to the area and a story that might increase the awareness of the general population in Iran and their care for the environment.